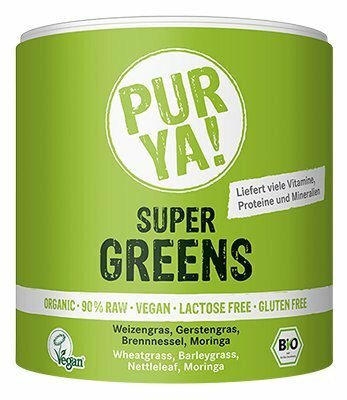 Organic Super Greens, 150 g./5.29 oz. 40% wheat grass, 40% barley grass, 10% nettle leaf, 10% moringa from certified organic agriculture! • Guaranteed GMO and Pesticide Free. Enrich your protein shake, smoothie, yogurt, cereal or fruit drink with a tablespoon of Super Greens. Store the can in a cool, dry place, below 75 ° F.
Place all ingredients in the blender. Then add some water. Now mix well until the blend is smooth and creamy. If needed, add a little more water. ORGANIC SUPER GREENS- Contains phytonutrients which health and prevents disease. PROVIDES DIGESTIVE ENZYMES which are responsible for breaking down of foods into nutrients. GOOD SOURCE OF FIBER- normalizes bowel movements and helps control blood sugar.